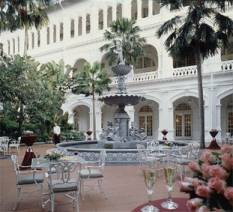 Steeped in history, Raffles Hotel is the epitome of elegant days gone by. Built in 1887, it was considered the place to stay by upper class British colonials and, even today, no visit to Singapore can be considered complete without stopping by. Standing on the corner of Beach and Bras Basah roads in the heart of Old Singapore, it brings in thousands of daily visitors eager to catch a glimpse of a fashionable yesteryear. English writer, Somerset Maugham, once called Raffles Hotel the legendary symbol for "all the fables of the Exotic East". Popularized in the 1920's and onwards by the likes of Noel Coward, Rudyard Kipling, Joseph Conrad and Charlie Chaplin, Raffles guest list reads like a who's who of famous faces. Set in tropical gardens and terracotta-tiled courtyards, the hotel was a British oasis and relaxing in the Long Bar played a quintessential part in this civilized stopover to an unfamiliar, Asian world. The Long Bar is designed in the style of the old Malaysian plantations of the 1920's, with many drawings of flapper girls and young men in their dinner suits and top hats. You can easily visualise Noel Coward in his smoking jacket, tinkling the ivories of the piano, while he sings songs about mad dogs and Englishmen. Suspended from the ceiling are rows of wicker fans attached to motorized contraptions that turn a pulley and cause the fans to twirl. It's an ingenious early pre-air conditioning method that wafts a cool breeze over you as you sip your drink. In the bar there are bowls of monkey nuts and it is slightly ironic that tradition dictates you drop the shells on the floor when littering is actually an offence in Singapore. Although sparrows fly in from the balcony outside and sit on the floor to eat the shells, wherever you walk there is a fabulous crunching sound, so don't be prudish. 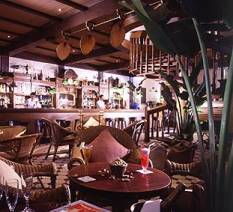 But the signature tune of this legendary bar is the world famous Singapore Sling. First prepared in the original Raffles Hotel, the seriously fruity drink was invented by barman Ngiam Tong Boon. The popularity of the drink spread throughout the world and although tourists may have tasted the drink in their own country, they still love to sit and sip the drink in the very place that it was invented. Bartenders at the Long Bar will tell you that the famous Sling contains gin, cherry brandy, Bènèdictine, Cointreau, pineapple and lime juice. But the proportions are their secret. American-born Gretchen Liu, wife of a Singaporean native, and who has put together a long and full history of the hotel, said "We are not sure what the original was like - drink menus didn't exist in those days - but we have some of the tools he [Ngiam Tong Boon] worked with, including his bar safe." Even the exact date of invention is in question, with some people claiming it was in 1915, and some in 1913, while the hotel itself claims that it was created sometime prior to 1910. There is also plenty of disagreement as to how closely the current version of this drink that is now served at Raffles is to the original. Apparently the original recipe was lost and forgotten sometime in the 1930's, so the drink that they serve at the Long Bar is based on memories of former bartenders and some written notes that they were able to discover. Use 10ml (0.35 fl oz) grenadine, 30ml (1 fl oz) gin, 15ml (0.5 fl oz) cherry brandy and sweet and sour mix. Pour the grenadine into the bottom of a Collins glass, and fill with ice. Add the gin, and almost fill with equal parts of the sweet and sour mix and chilled soda. Top with cherry brandy, and serve unstirred, garnished with a cherry. 30ml (1 fl oz) Gin, 15 ml (0.5 fl oz) Cherry Brandy, 120 ml (4.25 fl oz) Pineapple Juice, 15 ml (0.5 fl oz) Lime Juice, 7.5 ml (0.25 fl oz) Cointreau, 7.5 ml (0.25 fl oz) Dom Benedictine, 10 ml (0.35 fl oz) Grenadine, a dash of Angostura Bitters, and garnish with a slice of Pineapple and Cherry. Of course, you could always indulge yourself and fly to Singapore and have it made for you! Cocktails are served everyday, between 11.00 a.m. - 12.30 a.m. on Sunday to Thursday, and 11.00 a.m. - 1.30 a.m. on Friday, Saturday and the Eves of Public Holidays. There is a fairly high turn over people coming and going, so you should have no problem finding a table in the two L-shaped bars, one upstairs and the other downstairs at the rear of the building. To complement the Asian and traditional pub favourites that the bar serves for lunch, is an extensive list of every alcoholic and non-alcoholic concoction imaginable. Dress is casual/formal. Although many people (myself included) find that a couple of hours are plenty, and that the prices are high, it wouldn't be the same if you went to Singapore and didn't have a Sing Sling. It's like having a Guinness in Dublin or a Manhattan in Manhattan. Sometimes these things just have to be done.